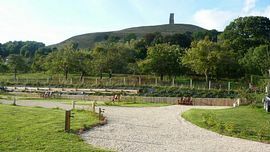 With the Glastonbury Tor bus passing close by every 20 minutes all of the local attractions can easily be reached with minimum effort! 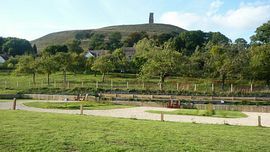 As well as the touring caravan and camping facilities, there are self catering cottages available to rent throughout the year, so non caravanning or camping members of the family can accompany you if a family get together is desired! A toilet and shower block is due to be operational by late May, and free Wifi is available at all pitches, all included in the standard £15.00 per night charge. We are a Caravan and Camping Club members site, but if you are not a current member, you are welcome to book and we will provide you with an application pack during your stay. You can't get much closer to the Glastonbury Tor! 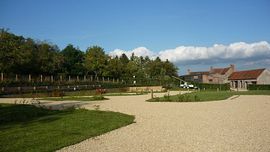 A touring caravan site experience at CS site prices! hardstanding pitches at the ready. 1 mile from Glastonbury heading towards Shepton Mallet. After passing the turning to Ashwell Lane on your left, the entrance is found shortly after in 300 yards. Caravan - Motorhome, £15.00 per pitch 2 persons including electric hookup, any night any season! Camping from £10.00 per night - 2 persons. Single person discount 20%. If you have booked, paid on-line and have your email confirmation receipt, (providing no nuisance is caused to other site users,) your arrival can be any time from 1.00pm onwards. Vacating of the site on your day of departure must be by 12.00 mid-day.